We have listed some of the commonly used protocols for adjuvant chemotherapy in lung cancer. This is not a comprehensive list. The protocols are not arranged in order of preference, but alphabetically. Tablet Tramadol 50 mg PO BD X 3 days. The metabolism of paclitaxel is catalyzed by cytochrome P450 isoenzymes CYP2C8 and CYP3A4. Caution should be exercised when administering paclitaxel concomitantly with known substrates or inhibitors of the cytochrome P450 isoenzymes CTP2C8 and CYP3A4. Caution should be exercised when paclitaxel is concomitantly administered with known substrates (e.g. midazolam, buspirone, felodipine, lovastatin, eletriptan, sildenafil, simvastatin, and triazolam), inhibitors (e.g. atazanavir, clarithromycin, indinavir, itraconazole, ketoconazole, nefazodone, nelfinavir, ritonavir, saquinavir, and telithromycin), and inducers (e.g., rifampin and carbamazepine) of CYP3A4. Caution should also be exercised when paclitaxel is concomitantly administered with known substrates (e.g. repaglinide and rosiglitazone), inhibitors (e.g., gemfibrozil), and inducers (e.g., rifampin) of CYP2C8. Potential interactions between paclitaxel, a substrate of CYP3A4, and protease inhibitors (ritonavir, saquinavir, indinavir, and nelfinavir), which are substrates and/or inhibitors of CYP3A4, have not been evaluated in clinical trials. Nephrotoxic drugs: increased nephrotoxicity; not recommended -Phenytoin: reduced absorption of the antiepileptic. If a Grade 2 neuropathy (paresthesia interfering with function, but not interfering with ADL) or worse develops, paclitaxel dose should be reduced to 160 mg/m2. If progressive neuropathy is observed after this dose reduction, then treatment with paclitaxel should be discontinued. Felip E, Rosell R, Maestre JA, Rodríguez-Paniagua JM, Morán T, Astudillo J, et al. Preoperative chemotherapy plus surgery versus surgery plus adjuvant chemotherapy versus surgery alone in early-stage non-small-cell lung cancer. J Clin Oncol 2010;28:3138-45. TAXOL (paclitaxel) INJECTION. Available from: https://www.accessdata.fda.gov/drugsatfda_docs/label/2011/020262s049lbl.pdf. PARAPLATIN Label. Available from: https://www.accessdata.fda.gov/drugsatfda_docs/label/2010/020452s005lbl.pdf. Paclitaxel and Carboplatin in NSCLC (Non-small cell lung cancer), South East London Cancer Network, NHS. http://www.londoncanceralliance.nhs.uk/media/40047/nsclc_paclitaxel_carbo_protocol_v1.0.pdf. Caution should be exercised when paclitaxel is concomitantly administered with known substrates (e.g., midazolam, buspirone, felodipine, lovastatin, eletriptan, sildenafil, simvastatin, and triazolam), inhibitors (e.g., atazanavir, clarithromycin, indinavir, itraconazole, ketoconazole, nefazodone, nelfinavir, ritonavir, saquinavir, and telithromycin), and inducers (e.g., rifampin and carbamazepine) of CYP3A4. Caution should also be exercised when paclitaxel is concomitantly administered with known substrates (e.g., repaglinide and rosiglitazone), inhibitors (e.g., gemfibrozil), and inducers (e.g., rifampin) of CYP2C8. In general, renal function should have normalized before patients are retreated. If continued treatment is considered to be mandatory, the following dose modifications could be considered at the physician's discretion. 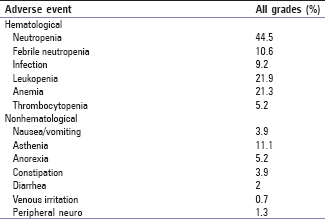 Geriatric patients may be at higher risk of developing nephrotoxicity, ototoxicity/neurotoxicity, or hematologic adverse effects with cisplatin. Dosage and safety not definitively established. Children maybe at higher risk of ototoxicity. Rosell R, Gatzemeier U, Betticher DC, Keppler U, Macha HN, Pirker R, et al. Phase III randomised trial comparing paclitaxel/carboplatin with paclitaxel/cisplatin in patients with advanced non-small-cell lung cancer: A cooperative multinational trial. Ann Oncol 2002;13:1539-49. Cisplatin drug monograph, CCO Formulary; August, 2016. Available from: https://www.cancercareontario.ca/en/drugformulary/drugs/cisplatin. Skin rash has been reported in patients not pre-treated with a corticosteroid. Standard therapy to reduce the incidence and severity of skin reactions includes dexamethasone 4 mg PO twice daily given the day before, the day of, and the day after pemetrexed administration. Treatment-related toxicity, including bone marrow suppression, diarrhea, and mucositis, are significantly reduced by supplementing with folic acid and Vitamin B12. Patients should take 0.4 mg oral folic acid (0.35 – 1 mg) daily beginning 1 week before and continuing daily until 3 weeks after the last pemetrexed dose. At least 5 daily doses must be taken during the 7 days before the start of therapy. Patients should also receive Vitamin B12 1000 mcg IM injection 1 week before pemetrexed therapy. This should be repeated every 9 weeks until 3 weeks after the last pemetrexed dose. Phenytoin: reduced absorption of the antiepileptic. 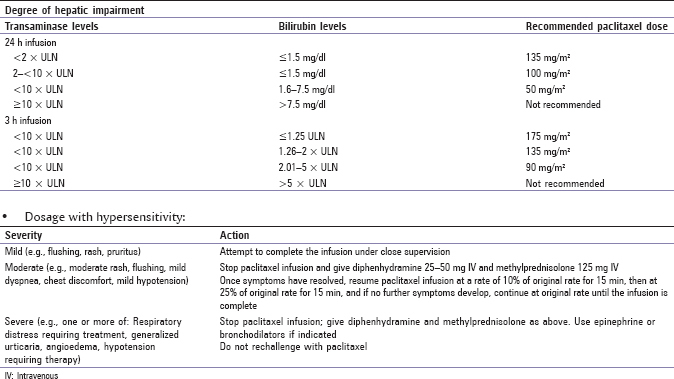 Laboratory monitoring and dose reduction/discontinuation recommendations. If there are two or more delays, a 25% dose reduction of both carboplatin and pemetrexed may be considered. If EDTA-GFR or calculated creatinine clearance <20ml/min, carboplatin is contraindicated. No dose adjustments indicated. Pemetrexed is primarily renally excreted unchanged. However, it has not been studied in patients with hepatic impairment. If a patient suffers any Grade 3 or 4 toxicity after 2 dose reductions, treatment must be reviewed. Zhang L, Ou W, Liu Q, Li N, Liu L, Wang S, et al. Pemetrexed plus carboplatin as adjuvant chemotherapy in patients with curative resected non-squamous non-small cell lung cancer. Thorac Cancer 2014;5:50-6. ALIMTA (pemetrexed disodium) Injection. Available from: https://www.accessdata.fda.gov/drugsatfda_docs/label/2009/021462s021lbl.pdf. Lung Pathway Group – Pemetrexed in Non-Small Cell Lung Cancer (NSCLC). Available from: http://rmpartners.cancervanguard.nhs.uk/wp-content/uploads/2017/03/lca-lung-protocol-pemetrexed-1.pdf. Complete blood cell counts, including platelet counts, should be performed on all patients. Patients should be monitored for nadir and recovery, which were tested in the clinical study before each dose and on days 8 and 15 of each cycle. Patients should not begin a new cycle of treatment unless the ANC is ≥1500 cells/mm, the platelet count is ≥100,000 cells/mm3, and creatinine clearance is ≥45 mL/min. Periodic chemistry tests should be performed to evaluate renal and hepatic function. Dose adjustments at the start of a subsequent cycle should be based on nadir hematologic counts or maximum nonhematologic toxicity from the preceding cycle of therapy. Treatment may be delayed to allow sufficient time for recovery. These criteria meet the CTC version 2.0 (NCI 1998) definition of ≥ CTC Grade 2 bleeding. 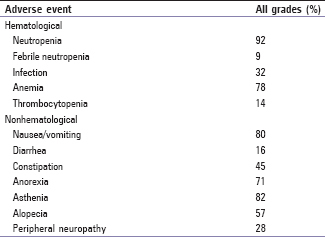 If patients develop nonhematologic toxicities (excluding neurotoxicity) ≥Grade 3, treatment should be withheld until resolution to less than or equal to the patient's pre-therapy value. 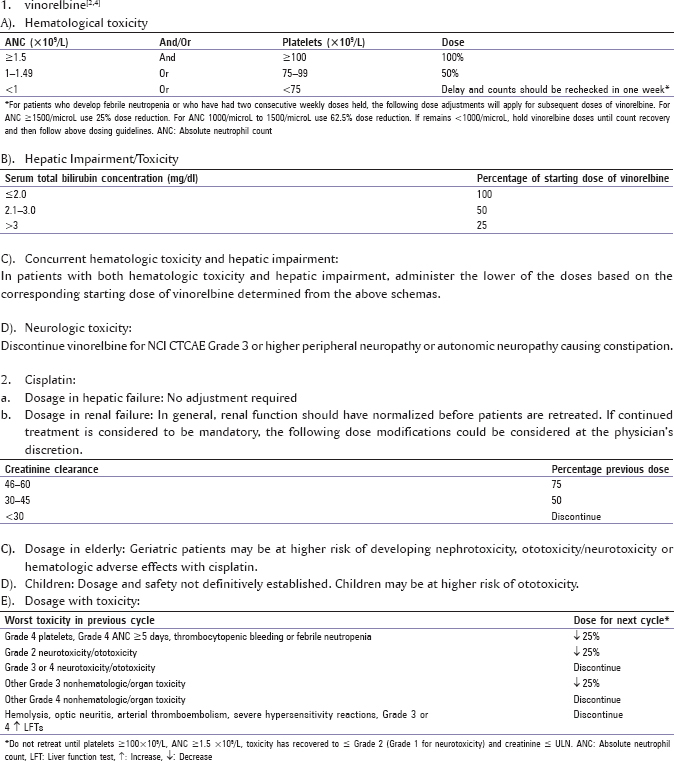 Treatment should be resumed according to guidelines in the following Table. 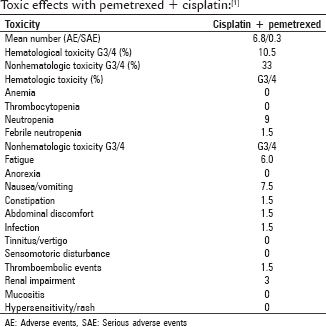 In the event of neurotoxicity, the recommended dose adjustments for pemetrexed and cisplatin are as shown in Table. Patients should discontinue therapy if Grade 3 or 4 neurotoxicity is experienced. Caution should be exercised when administering pemetrexed concurrently with NSAIDs to patients whose creatinine clearance is <80 mL/min. Kreuter M, Vansteenkiste J, Fischer JR, Eberhardt W, Zabeck H, Kollmeier J, et al. Randomized phase 2 trial on refinement of early-stage NSCLC adjuvant chemotherapy with cisplatin and pemetrexed versus cisplatin and vinorelbine: The TREAT study. Ann Oncol 2013;24:986-992. Cisplatin Drug Monograph. CCO Formulary; August, 2016. Available at: https://www.cancercareontario.ca/en/drugformulary/drugs/cisplatin. Cap. Aprepitant 125 mg on day 1 and 80 mg on day 2 and 3. Cycle is repeated every 3 weeks for a maximum of four cycles. Caution should be exercised in patients concurrently taking drugs known to inhibit drug metabolism by hepatic cytochrome P450 isoenzymes in the CYP3A subfamily, or in patients with hepatic dysfunction. Concurrent administration of vinorelbine tartrate with an inhibitor of this metabolic pathway may cause an earlier onset and/or increased severity of side effects. Vinorelbine: if patients with hepatic insufficiency are due to metastatic disease, liver function may recover in response to treatment. Therefore, it is suggested that the dose of vinorelbine be reduced to 85% dose and hematological toxicity closely followed up. Discontinue vinorelbine for NCI CTCAE Grade 3 or higher peripheral neuropathy or autonomic neuropathy causing constipation. Tan EH, Szczesna A, Krzakowski M, Macha HN, Gatzemeier U, Mattson K, et al. Randomized study of vinorelbine – gemcitabine versus vinorelbine – Carboplatin in patients with advanced non-small cell lung cancer. Lung Cancer 2005;49:233-40. Navelbine Prescrinig information. Available from: https://www.accessdata.fda.gov/drugsatfda_docs/label/2002/20388S014lbl.pdf. Lung Pathway Group – Carboplatin and IV Vinorelbine in Non-Small Cell Lung Cancer (NSCLC). Available from: http://www.londoncanceralliance.nhs.uk/media/96956/lca-lung-protocol-carboplatin-iv-vinorelbine.pdf. Caution should be exercised in patients concurrently taking drugs known to inhibit drug metabolism by hepatic cytochrome P450 isoenzymes in the CYP3A subfamily, or in patients with hepatic dysfunction. Concurrent administration of vinorelbine tartrate with an inhibitor of this metabolic pathway may cause an earlier onset and/or an increased severity of side effects. Monitor for hearing loss prior to each dose of cisplatin; audiometry as clinically indicated. Douillard JY, Rosell R, De Lena M, Carpagnano F, Ramlau R, Gonzáles-Larriba JL, et al. Adjuvant vinorelbine plus cisplatin versus observation in patients with completely resected stage IB-IIIA non-small-cell lung cancer (Adjuvant Navelbine International Trialist Association [ANITA]): A randomised controlled trial. Lancet Oncol 2006;7:719-27. Vinorelbine Injection. United States Prescribing Information. US National Library of Medicine. Available from: https://www.accessdata.fda.gov/drugsatfda_docs/label/2002/20388S014lbl.pdf.